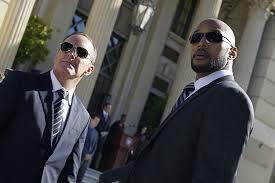 SEASON FOUR, EPISODE TEN- "THE PATRIOT"
Tonight's episode begins with a press conference welcoming Quake to S.H.I.E.L.D., the big theme of this season is S.H.I.E.L.D. trying to get the world to trust the Inhumans, and the Watchdogs and Senator Nasir foiling those attempts by S.H.I.E.L.D. Tonight, a group (presumably the Watchdogs) try to assassinate Director Mace. Then, later on in the episode, when Mack and Coulson are taking Director Mace to find a special briefcase, their Quinjet is shot down. Most of the episode is geared towards Coulson, Mack and Mace looking for this briefcase, that Mace has been infatuated with since he began directing S.H.I.E.L.D. Everybody can feel it, and apparently the episode hinges on a big secret shared between Mace and Glen Talbot. For a show about a spy agency, you'd think we'd get more secrets than we do. What is the big secret between Talbot and Mace? Is Mace HYDRA? Is he a villain? Does he possess the mystery shiny things from "Pulp Fiction?" Its sad because once the secret is revealed, its almost numbing how lame it is. You see, Director Mace really isn't an Inhuman. He's a walking, talking publicity stunt. Apparently, Glen Talbot oversaw a new serum similar to the Super-Soldier serum used on Steve Rogers. It gives Mace super-strength, but in small doses, he has to keep injecting himself with this drug in order to gain the superhuman abilities. S.H.I.E.L.D. needed a new face in order to for the world to respect and accept The Inhumans, so why not a create a faux Inhuman to head the organization? I suppose it makes sense, its just a very unexciting conceit to hang on the show. And it all gets resolved much too quickly. The briefcase is found, the contents destroyed, then everybody learns the truth, everybody gets out alive. No harm, no foul. The fight between Mack and a Watchdog operative with garden tools was fun, but its all over before it even begins, and the secret just never lives up to anything cool. I guess this is just an early filler episode, a brief lapse for whatever is on the way. There is an interrogation sequence that coin sides with the hunt for Mace's briefcase. It is conducted by Glen Talbot and Jemma and Fitz. They capture a shooter who tried to kill Mace at the beginning of the episode. Jemma gets a big gag moment when she plays "bad cop" to Talbot's "good cop." I love how Jemma's character has grown through this show, and how she continues to grow has been more yummy icing on this piece of cake. What was really intriguing was that Fitz is doing...something with the severed Aida head that Mack took off last episode. What is Fitz doing and why is he being so secretive about it? Next episode hints at a mole in the organization and I have to ask, can it be Fitz? Golden boy Fitz a villain? That would honestly be incredibly stupid, because after this long and how his character has behaved, it wouldn't be some new age, WTF twist. It would feel forced. The audience would feel cheated and they'd be right. Read carefully ABC, do not make Fitz a villain. Agent May, the real Agent May nearly escaped the clutches of Dr. Radcliffe and Aida but with no success. Its also pretty clear that Robot Agent May just found out that she's not what she thinks. That should lead to some prime cool material. But telling from Dr. Radcliffe's admitting slowed burn plot, this is something that won't materialize until later. I wonder if a episode like we got tonight is even worth it, when they clearly have a big story they want to tell. Nurture what's going on with Dr. Radcliffe, and Jemma and May and Fitz. I mean, the whole Inhuman-Senator-Mace thing is something I really don't even feel is needed right now and ruining what could be a cool story. Yes, I didn't sing the praises for the LMD stuff, but its starting to show its potential. That potential just keeps getting interrupted by familiar Inhuman stuff. What did everyone else think? "Star Wars: Episode Eight" is "The Last Jedi"
Peter Dinklage may join "Avengers: Infinity War"
Review: Gary Oldman delivers all sorts of goods in Joe Wright's "Darkest Hour"
Review: An all-star cast impeccably performs "Three Billboards Outside Ebbing, Missouri"
Review: "Red Sparrow" is a brilliant showcase for J-Law, but a slow sludge through the spy game. Review: The story of National Lampoon's comes to stuttering life in "A Futile And Stupid Gesture"
Review: "The Leisure Seeker" is a highlight for Mirren and Sutherland. Review: "12 Strong" is a bombastic yet bright military movie.